Today’s job market is highly competitive and requires that students be focused, prepared and active in their job search to secure the right position by graduation. Employers are seeking well-rounded candidates who demonstrate leadership by going above and beyond academic performance. Your involvement in campus and community events and organizations are essential ways to enhance your resume and build new skills and experiences that you can bring to a prospective employer. 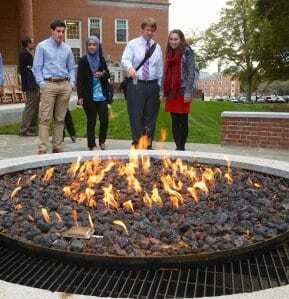 Students at Wake Forest will hear references to having fire in your belly as it relates to your job search. Candidates who are focused and engaged in their job search early in their academic experience tend to navigate the process more easily. Employers are increasingly interested in connecting with students as early as possible on campus, which requires that our job seekers are motivated and prepared. Your ability to leverage the resources of the Center to “find your fire” early in the process will enhance your job search success. Many industries increasingly rely on networks to identify new talent for their organizations. They expect potential candidates to be proactive in reaching out to industry and company contacts even before being offered an invitation to interview. Many jobs never reach an online job posting site, and are instead filled through referrals from current employees. Effectively networking within your target industries and organizations will be essential for your job prospects. While the job market can be challenging, the Center for Market Readiness & Employment offers a range of resources to ensure that you are well prepared and can implement an effective job search strategy. Learn More.